Announcing the Winners of "Review a Social DApp" Contest ft. State Of The DApps! 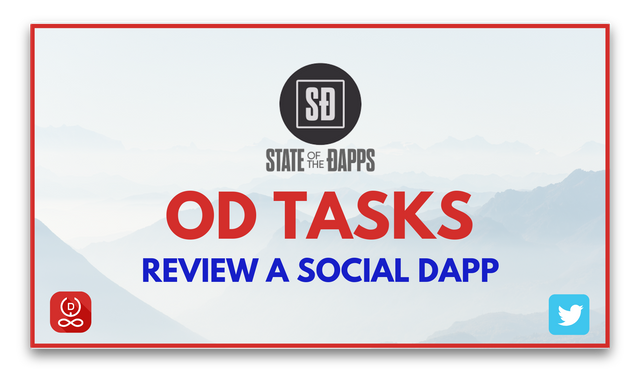 10 days ago, we launched this task - Review a Social DApp & Earn Rewards ft. State Of The DApps!. Another successful run and brilliant entries submitted by many Steemians in the comments of this blog by @oracle-d.tasks. Exploring Viola.AI: an AI general love advisor powered by blockchain technology! by @dedicatedguy. Tripsteem for Travel Bloggers | DApp Review by @rosatravels. Meet Partiko - The Social Media DApp of the Future! by @daan. Many congratulations to all the winners. Please create a post about your experience and your win in the competition which will be used to give the rewards. The winners will also get access to the internal/closed OD Tasks available on OD Portal. Major thanks to @stateofthedapps and team for partnering up with us for the challenge. Please stay tuned for the future tasks! I'm so honoured by this community. Thanks a lot guys. Well done @daan @eugelys @samminator @rosatravels @dedicatedguy I’m going to take a good read of all the reviews - I might take the recommendations and start using a wider selection of Steem DApps - after all this time next year I bet the volume of Apps has quadrupled! Steem is clearly a great place for App Developers! Wow, I definitely didn't expect this! The fact that my article is going to be published on State of the DApps is amazing. Thank you @oracle-d, @dapplovers & State of the DApps for hosting such an incredible contest! What an honor to be among the winners of this contest and to be able to see my review https://www.stateofthedapps.com/dapps/ntopaz! Thank you very much @oracle-d & @dapplovers. As a user of nTopaz I am very grateful for all the support my musical work has received on this platform. But once I started to do my review I realized all the huge effort that its creators and collaborators have put into designing this dApp. I hope you will give a try and enjoy your experience very much! Congratulations to all the winners and participants! What a great competition. It makes you realise how much work is going on behind the scenes, when you see how many dapps there are on https://steemit.com/@stateofthedapps. Some really informative reviews done by all of the writers that took part. Well done to all of you. Congratulations to the winners, I just found out about the dapplovers project and its really awesome.Incase you dont have a review for Drugwars dapp, here I made one today, hopefully you can check it out, it follows all the rules and guidelines. Though I'm yet to share it to my other social media accounts. This is not only winning moment but it is great respect for hard work and devotion..I also appreciate every people effort who is making contribution in reviewing awareness about the Dapps. My warmest congratulations to top five winners and also those steemains friends who participated in this contest. Thank you brother @dapplovers and @oracle-d for your awesome contest. Congrats to all winners, thank you for initiating this @dapplovers. I hope to see an extension for this contest. Its fruitful event! Congrats to the winners. Really amazing articles here. Well done, for all of winners for awesome dapps review! Congratulations guys.... lots of things to learn from you guys.Thanks a lot guys. This article translated @Dapplovers Announcing the Winners of "Review a Social DApp" Contest ft. State Of The DApps! into Japanese. I arranged a little. super cool initiative by you guys @dapplovers. I can see how this is going to support all the DAPPs on top of Steem when people start to flood in them and give it a good review(they know only review up to the standard would be rewarded). This project really boost the entire space in a creative way that I never thought of. Kudos! We were happy to see our dapp, cXc Music reviewed! !